There are some real downsides to having kids. Beyond the usual complaints of sleep deprivation and the annoying-ness of nonstop whining and general neediness, there comes a day when your kids are old enough to watch movies. And in an attempt to share meaningful experiences and rituals or whatever, you establish a Friday Night Movie tradition, whereby you watch a previously unseen movie together. Only your kids want to weigh in on the movie decision, which I guess should be a good thing because it means they're invested in the activity, and they choose Dolphin Tale 2. Without ever having even seen Dolphin Tale, the original, because there is no way you would ever choose to sit through that movie. But you love your kids, I suppose, so you acquiesce. Which brings me to this review. I hate sequels. This is a well known fact. I had no idea how much less pleasurable a sequel is when you have never seen the first movie. Not only do you have to play catch up on the plot, but there is zero emotional investment in the characters. Do I care about Winter, the handicapped bottle nosed dolphin? Nope. Which, of course, poses a slight problem as the movie is mostly about her. Again. Not to say I don't care about sea creatures--I do. And dolphins are impossibly adorable. But I just don't care for movies about animals. At least, not where the animal is really the main character. Even more so if there is a voiceover for the animal (which, thankfully, is not the case here). 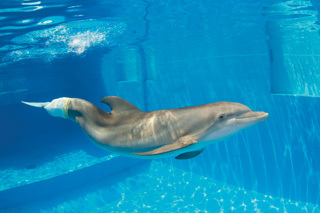 I know Winter is a real dolphin and all and her story is pretty cool. I just don't want to watch a movie about it. There are other things going on in the story. There's an awkward, not totally realized love story between two unattractive teens who I assume are from the first movie (only further convincing me never to watch it). There's high drama surrounding the USDA's regulations surrounding dolphin captivity. 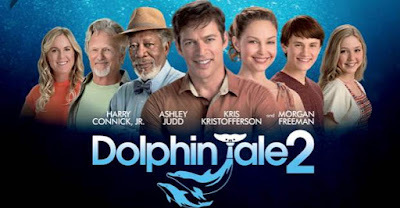 And there are enough cameos from Morgan Freeman to wonder if he personally knows these dolphins or if someone blackmailed him to be in this movie. I will say that I am impressed at the number of factual details the movie got right, considering how fast and loose writers play it with the words "based on a true story." The fact that there was (debatably) enough material from this aquarium to warrant a second movie is impressive. And I know how meaningful the first movie was to the disabled community--they don't get a whole lot of visibility in Hollywood. But I still can't help but feel like I wasted a Friday night. Final word: Don't have kids. See above for reasoning.